Lee and Tyrol enjoy a drink in the newly discovered bar. Lee sits in the bar and contemplates his marriage. Gaeta listens to Baltar... with the pen nearby. Adama and Roslin visit Baltar... likely to ask him if he's a Cylon. Doctor Cottle's back... along with medic Ishay. Baltar's Inner Six pays him a visit. and greeted by the dead that he is responsible for. Baltar again dreaming he's in the resurrection tank. Inner Six looks to again be bolstering Baltar's fragile psyche. 10/21/06: The [working]episode title is a reference to a line from the theme song of Cheers, a long running sitcom set in a Boston bar. 10/18/06: Tyrol finds the bar, whose existance is apparently not widely known. 10/18/06: A Galactica officer attacks Baltar in the brig, stabbing him in the neck with a pen. 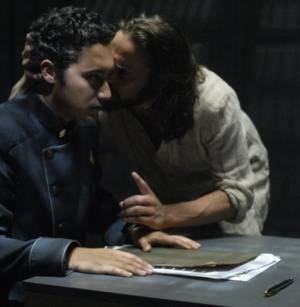 [Previews have shown Gaeta in the cell with Baltar, but his culpability is speculation at this point.] 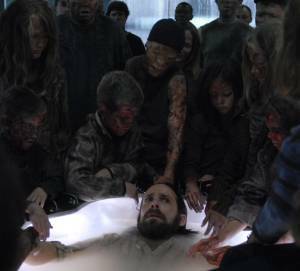 As a result, Baltar has a near-death experience in which his Inner Six tells him that he's human and thus cannot be resurrected if he dies. 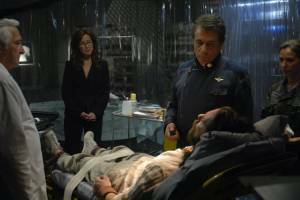 10/7/06: Baltar is in the brig and Roslin visits him. 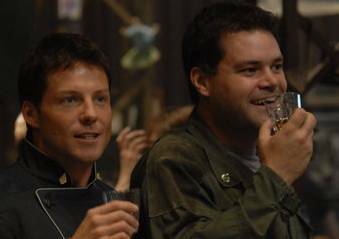 The scene mirrors Baltar's visit to Roslin in Episode 301. Baltar later ends up nearly dying. His Inner Six tells him that he's not a Cylon, but a human. Baltar flashes back to discussions with Number Three concerning the hybrid and the five unknown humanoid models. He was there watching the Three model be terminated and he asked her if he was a Cylon. 10/7/06: Apparently, spending time in the bar helps Dee and Lee "reconnect." 10/3/06: Tigh takes a stand to keep a bar from being closed. 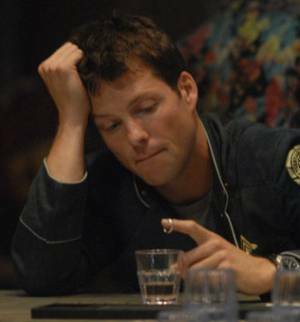 9/27/06: Preliminary Episode Synopsis: Baltar is recaptured and ends up in the brig. He is now suspected of being a Cylon and he's not sure that they are wrong.